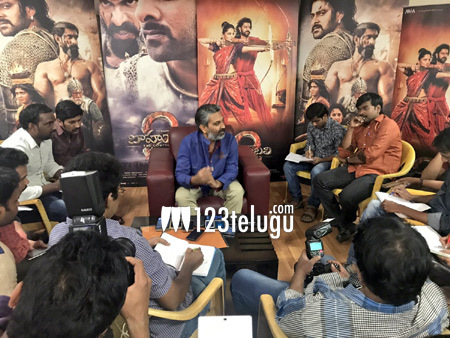 While his most eagerly awaited magnum opus Baahubali The Conclusion is slated for a grand worldwide​ release in a few hours, director Rajamouli today met Telugu film media a spoke at length about the making of this epic wat drama. Rajamouli described Baahubali as the most satisfying movie in his career and said that he had never imagined that the movie would take 5 years for its completion. Jakkanna went on to say that he could complete Baahubali only with the support from his family, producers and Prabhas. Much to everyone’s surprise, Rajamouli revealed that there will be a lot of humor in Baahubali 2.